Can a Felon Get a Captain’s License? There are resources available for felons looking to establish themselves in a new profession. Some felons may have experience in boating and an interest in a career chartering a boat. 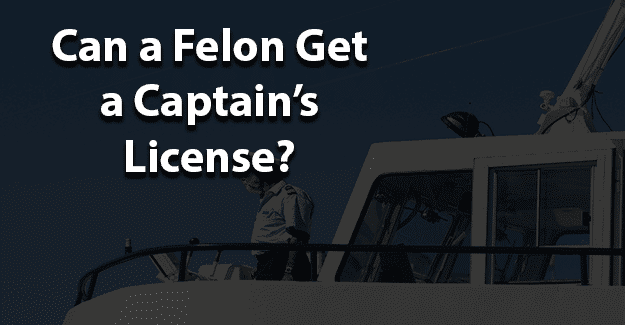 This blog post will address the issue of whether or not a felon can get a captain’s license. What Is Required to Get a Captain’s License? A license is issued by a state agency to practice a profession and is required in order to call oneself a licensed professional. A license shows that someone has specific knowledge or skill necessary to do a job. Typically, these types of credentials are obtained after completing certain education. A captain is the leader of a vessel and is responsible for its navigation and operation of all equipment, along with commanding all crew members. A captain’s license, often called a Merchant Mariner’s Credential, is a permit issued through the U.S. Coast Guard allowing someone to legally carry, “passengers for hire.” This will allow a person to do such things as book charters for fishing, sightseeing, or transportation on the water. Operator license – This is for uninspected vessels (boats that hold up to six passengers, weigh up to 100 gross tons, and travel up to 100 miles offshore). Master license – This is for inspected vessels (larger boats that can carry seven or more passengers and travel up to 200 miles offshore or on inland waters). There will be a background check for a captain’s license. The Coast Guard conducts a criminal background check and a National Driver’s Registry report on all applicants. When applying for a captain’s license, there will be a series of questions relating to the use of dangerous drugs or convictions by any court for offenses other than minor traffic violations. A conviction means an applicant for a Merchant Mariners document has been found guilty by judgment or plea in a court of record of the U.S., District of Columbia, or any state territory of the U.S. along with any foreign country or military court. All convictions for DUI, drug, and felony offenses are reviewed by the U.S. Coast Guard. Depending on the offense, a holding period of one to ten years may be applied before becoming eligible for a captain’s license. This will be handled on a case-by-case basis. A later expungement of the conviction will not negate that conviction unless the Coast Guard is satisfied that the expungement is based on a showing that the court’s earlier sentence was in error. The Coast Guard is not interested in whether a conviction was erased through expungement; they want to know whether a conviction has occurred in the first place. When applying for a captain’s license, is important to disclose any felony convictions. Not reporting a conviction will mean that the Coast Guard will consider the applicant to have submitted a fraudulent application. This will result in immediate denial of any captain’s license. It is essential to be honest in filling out an application for a captain’s license. If a felony isn’t disclosed but found on a background check, this is fraud which is a punishable crime, which could result in being sent back to prison. Having their felony expunged may or may not give them the chance needed to begin with a clean record and succeed in getting a captain’s license. Expunging a criminal record typically allows anyone to honestly state on an application that he or she has not been convicted of a crime. This is not the same according to the Coast Guard, however. It could be worth the effort to go through the steps in obtaining a captain’s license. Giving him or herself the best chance for success by having his or her record expunged and also documenting any programs, education, or training completed could have a critical impact for any felon that has had a hold placed on his or her record as a result of a felony conviction. Having support from family, friends, counselors, or previous employers can make a huge difference. A felon doesn’t have to be defined by his or her crime. What do you think about this blog post? Have you or someone you know been in the situation of trying to get a captain’s license with a felony? What was that like for him or her, and how did he or she achieve success? Please tell us in the comments below.